For the Adele song, see Cold Shoulder (Adele song). "Cold shoulder" is a phrase used to express dismissal or the act of disregarding someone. Its origin is attributed to Sir Walter Scott in a work published in 1816, which is in fact a mistranslation of an expression from the Vulgate Bible. There is also a commonly repeated incorrect folk etymology. "Ye may mind that the Countess’s dislike did na gang farther at first than just shewing o’ the cauld shouther..."
"... eminent individuals and his cabinet advisers turned "the cold shoulder" to their ambassador, for his independent act upon this occasion." Despite being repeated in several non-academic (non-scientific) books of etymology, the common explanation that the phrase stems from serving a cold shoulder of mutton or other meat to an unwanted guest is an incorrect folk etymology according to linguists. One source claims that the explanation of the expression is due to a very literal action: keeping one's back towards, or in the least a shoulder between, a person one was trying to avoid. The expression "cold shoulder" has been used in many literary works, and has entered into the vernacular. It has been used as a description of aloofness and disdain, a contemptuous look over one's shoulder, and even in the context of a woman attempting to decline the advances of an aggressive man. Overall, it remains widely popular as a phrase for describing the act of ignoring someone or something, or giving an unfriendly response. Look up cold shoulder in Wiktionary, the free dictionary. A phrase also coined by Sir Walter Scott, "lock, stock, and barrel"
^ "shoulder - Origin and meaning of shoulder by Online Etymology Dictionary". www.etymonline.com. Retrieved 3 March 2019. ^ a b "Cold shoulder « The Word Detective". www.word-detective.com. Retrieved 3 March 2019. ^ a b "World Wide Words: Cold shoulder". World Wide Words. Retrieved 3 March 2019. ^ a b c d e Martin, Gary. "Cold shoulder". The Phrase Finder. Gary Martin. Retrieved 25 October 2010. ^ "Charlton T. Lewis, Charles Short, A Latin Dictionary, ŭmĕrus". www.perseus.tufts.edu. Retrieved 3 March 2019. Eliot, Sonny; Hill, Draper; Williams, Stanley D. (2007). Sonny Sez! : Legends, Yarns, and Downright Truths. Wayne State University Press. p. 180. ISBN 0-8143-3335-4. Helterbran, Valeri R. (2008). Exploring Idioms: A Critical-Thinking Resource for Grades 4-8. Maupin House Publishing, Inc. p. 133. ISBN 1-934338-14-1. Hodgson, Charles (2007). Carnal Knowledge: A Navel Gazer's Dictionary of Anatomy, Etymology, and Trivia. Macmillan. p. 272. ISBN 978-0-312-37121-0. Jamieson, John; Johnstone, John; Longmuir, John (1867). Jamieson's Dictionary of the Scottish language. Edinburgh, W. P. Nimmo. p. 635. OCLC 70431433. The Nation. 69. Joseph H. Richards. 1899. ISSN 0027-8378. OCLC 1643268. Palmatier, Robert Allen (2000). Food: a dictionary of literal and nonliteral terms. Greenwood Publishing Group. p. 461. ISBN 0-313-31436-5. Scott, Sir Walter (1816). 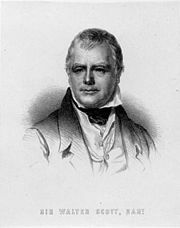 "The works of Sir Walter Scott. 3, The antiquary". James Ballantyne and Co. for Archibald Constable and Co. Edinburgh; and Longman, Hurst, Rees, Orme, and Brown, London: 370. OCLC 310724884. This page was last edited on 3 March 2019, at 21:48 (UTC).